Now that we’re solidly into Spring, it’s time to find meals that can be made ahead and heated up after a long day of turning the dirt, planting veggies, and generally cavorting outdoors. 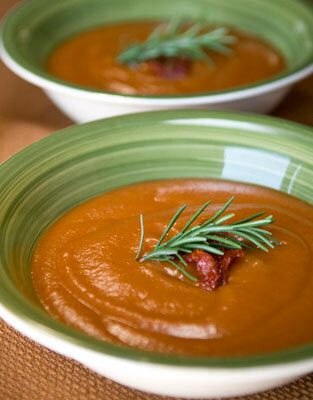 And what better solution to the quick-meal quandry than a fantastic bowl of soup? I know what you’re thinking, “soup is for cold weather days.” Au contraire! The recipes we share here represent the best of vegetarian soups: satisfying, light and full of healthy stuff. Serve any of them with some crusty bread, a salad, and your favorite beverage for a rewarding end to your busy day of gardening. Who knows…you may even find your knees buckling with pleasure as you slurp. This stock is good enough to serve as a first course consommé, in addition to using it as a basis for some of the recipes that follow. Baking or caramelizing the vegetables before adding the water gives an additional richness to the stock. If you wish, adding a 1 to 2 inch piece of kombu seaweed will also add a further depth of flavor. This stock will keep for 2 days, covered, in the refrigerator. It can also be frozen; divide it into 2- or 3-cup freezer containers. Feel free to add any vegetable trimmings from the bag in your freezer, but beware of cabbage or broccoli, whose flavors tend to dominate the stock. Of course, to save time you can use a boxed vegetable broth for these recipes, but the end result won’t be quite the same. 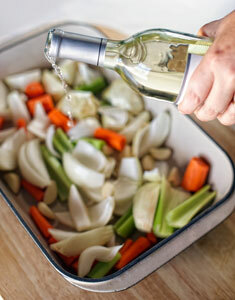 Place the onions, celery, leeks, garlic, and carrots in a shallow pan and pour the wine over the top. Bake uncovered for 1 1/2 hours. Heat the oil in a pot and add the caramelized vegetables and the green onions and sauté for 5 minutes, stirring occasionally. Add the remaining ingredients (except the water and peppercorns) and sauté for 5 minutes, stirring occasionally. Add the cold water and the peppercorns and bring the mixture to a boil. Then lower the heat to a simmer, cover, and cook for 2 hours. Remove the cover and simmer for another 30 minutes. Strain the stock through a fine strainer lined with cheesecloth or a coffee filter and salt to taste. 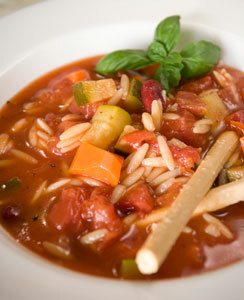 This minestrone is so vegetarian it’s almost vegan (except for those pesky little orzos)! Serve it with a hamburger (just kidding—make that a veggie burger) or with a side salad and some crusty bread. In a large pot, sauté the onion, carrots, and zucchini in olive oil for 6 to 8 minutes, until almost soft. Add the remaining ingredients, except for the beans. Bring the soup bring to a low simmer and cook for at least 20 minutes. Add the beans (if using) and cook for a few more minutes. Serve in individual bowls garnished with the parsley or basil. This recipe is from Susana Trilling, who owns the Seasons of My Heart Cooking School in Oaxaca, Mexico. It uses an herb called hoja santa that has a large, fragrant leaf. Look for it in Latin markets but if unavailable, watercress is the best substitute. Serve this soup with a dark beer like Negra Modelo and cornbread. Sauté the garlic in the olive oil in a soup pot until slightly browned, about 10 minutes. Add the hoja santa or watercress and sauté for 30 seconds. Add the stock, chile (if using), salt, pepper, and bay leaves and simmer for a half an hour. Remove the bay leaves and chile. Add the celery leaves just before serving. Place 5 cubes of bread and five of cheese in 4 individual soup bowls and ladle in the soup. Sprinkle with Parmesan cheese and serve. Here’s a soup that’s fast and easy to make. It depends almost entirely on the flavor of the fresh snow pea, one of nature’s great vegetables. Add firm Japanese silken tofu to make a complete protein soup if you like soybean products. For a complete meal, serve this before a entrée of vegetable tempura. In a pan, combine the water, sugar, parsley, garlic, scallion, soy sauce, ginger, and pepper and boil for 5 minutes. Add the watercress, cilantro, and snow peas and boil 3 more minutes. Transfer the soup to bowls, add the hot sauce to taste, and float the lemon wheels for garnish. To make tomato concassé, place fresh tomatoes in boiling water for a few seconds to loosen the skins, then peel them, remove as many seeds as possible, and squeeze out the juice. Then dice them as finely as possible. Serve this intensely-flavored bisque with a good red wine and sourdough bread. Add the sun-dried tomatoes to a large pot and cover with water. Turn the heat to medium. In a piece of cheesecloth, wrap the sage, rosemary, thyme, and parsley together and tie to make a bouquet garni. Add it to the water. Cover, reduce the heat, and simmer for 2 hours, adding water if necessary. Heat the oil in a skillet and sauté the onion until soft and translucent. Add the garlic and lightly sauté. Reserve. In a small saucepan, boil together the red wine and balsamic vinegar until it is reduced to 1/8 cup. Reserve. When the sun-dried tomato mixture is done, remove the bouquet garni and the lemon slices. Add the reserved onion-garlic mixture, the reduced liquid, and the tomato concasée. Simmer, uncovered, for 10 minutes. Remove from the heat and puree until smooth, then strain. To serve the bisque hot, add a dollop of sweet butter and swirl across the surface. To serve cold, top with a dollop of citrus créme fraiche. 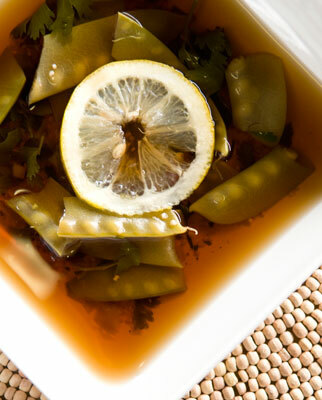 This vegetarian consommé can be substituted for vegetable stock in any recipe. The flavor of peppers dominates this powerful, spiced up broth. It is an elegant example of a first course soup that can precede any entree. 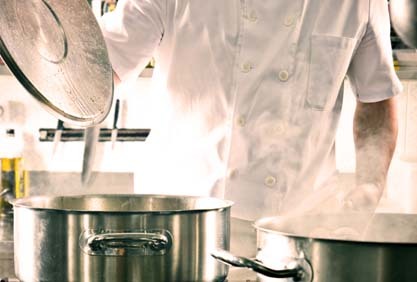 In a large stockpot, combine all ingredients except the water. Pour the boiling water over the ingredients and boil for 10 minutes. Reduce the heat and simmer, covered, for 1 1/2 hours. Remove from the heat and cool. Strain through a fine sieve lined with cheesecloth.